As you know, over Winter Break, the UMass Boston administration implemented increases in campus parking fees for students and for us, raising daily cash rates to $9 at Bayside, and $15 for on-campus parking. 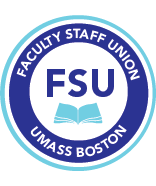 While our FSU collective bargaining agreement makes it possible for faculty to purchase discounted semester passes, and for some NTTs, there are discounted multi-park passes, our sister unions in PSU and CSU have yet to conclude this process. Many students and community members will have to pay these higher daily cash rates, which we fear threatens the accessibility and affordability of Boston's only public university, and puts many of UMB's low-income commuter students in jeopardy. *Talk to colleagues, friends, and students about this action, and invite them to join us on the picket line! *Refuse to park in the West Garage on Feb. 6, (park in Bayside or Lot D instead)! *Our students are not your revenue stream! *A Public Urban University must be accessible to the people it serves! *Stop punishing students and employees to pay for UMB's illegitimate legacy debt! *UMB Needs Garage Debt Relief Now!